The Hogan-Knotts Financial Group is a private financial planning business, the prodigy of a firm established in 1971 and incorporated in 1979. We offer conservative financial advice, counseling and investment management to a select group of individuals, multi-generational families, and businesses. Clients of our office want a high degree of financial expertise, a higher level of service than they are accustomed to, and who feel comfortable delegating the solving of their financial problems to an organization of credentialed, professional financial advisors. Headed by two principals with over 60 combined years of financial planning experience, we have seen many competitors come and go while remaining independent of all of those Wall Street firms and brokerage houses. We are not tied to any financial institution and do not “carry the torch” for any of them. This allows us to put our client’s interests first. They will never have to worry about any of our recommendations. Our unbiased advice and counseling is never backed by any “hidden agenda” for any particular financial service or product. The Hogan-Knotts Financial Group is focused on building long-term relationships. We are professionals, with professional designations, affiliations, and attitudes; enabling us to easily work with our client’s other professionals. We don’t compete with our client’s attorneys, accountants and retirement plan administrators, but work with them as part of a total team effort for our clients. It is our desire to make our clients proud to be associated with us. Our goal is to understand the things that mean the most to our clients and help them to successfully position themselves to reach their goals. 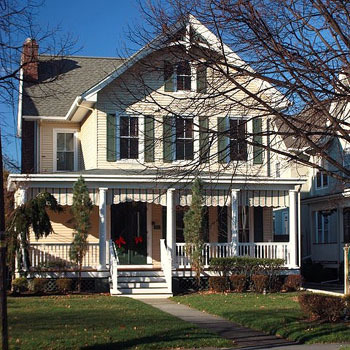 The office has been located in Red Bank, New Jersey for 30 years in the same 100-year old Victorian home, converted into comfortable, professional office space.